Sometimes too much sun does funny things to people. Over at Mecca bingo, it seems to have made them more generous than usual. But you won't hear us complain of the weather or this promotion, and we're sure you'll love it too. 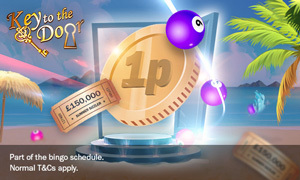 These single penny games are available right throughout the day, so there's nothing to stop you racing through those copper pennies over at Mecca bingo. You can also get the maximum number of tickets for just £1.20. They call it a Penny Summer Sizzler. We think it's a Proper Summer Scorcher. You can participate between 00.01 Monday 2 July and 23.59 GMT Sunday 2 September. Players must join the Key to the Door room and purchase tickets. The Penny Bingo takes place in the Key to the Door room. The ticket price of 1p is valid throughout the promotional period only. Games are linked between 6-8am, so excluded from the promotion.